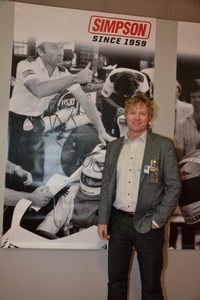 Anders Hildebrand (right, with wife Eva) of Eurodragster.com sponsor Anglo American Oil said that the company had reached a provisional working agreement for Sunoco to become the Official Fuel Supplier to the EDRS Series starting this year. "This will make it easier for racers", said Anders. "We will have to implement a supply chain to to get the fuel to the track. Sunoco being named on official fuel supplier makes it sensible to go with us. We are the only company in the USA to refine their own fuel where all the other companies blend. We are testing SR18, a replacement for C25 which has a higher octane and is more stable. It doesn't go off quickly so it is easier to handle. Sunoco will also be manufacturing nitro and methanol. We will hopefully introduce contingency sponsorship this year or next. Sunoco want to do a good job - it's not just about making money as we are a big enough company. It's better to hurry slowly and to make sure that everyone is happy." Kalle Lyrén's Pro Stock Bike was on display on the stand and Roger Lyrén agreed that the fuel deal with Sunoco will make things easier. "Fuel supply has been a problem at some tracks but one of the things connected to this package is distribution", he said. "It's better than people going around Europe with huge amounts of fuel in their trailers because you know what will happen eventually and it will only have to happen once. This deal is a natural progression since Sunoco has become the spec fuel in NHRA Pro Stock Bike. We will also be working on testing products." 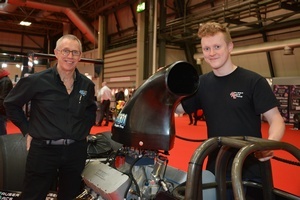 Wayne Jackson was helping to man the stand of sponsor Lucas Oil Products and Santa Pod Raceway whilst son and Super Pro ET racer Brad Jackson was at college. 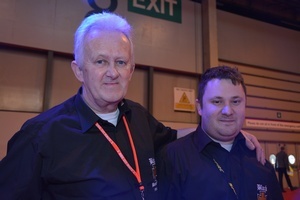 "Brad has done amazingly well on the huge leap into Super Pro ET", said Wayne. "We were really pleased to have been nominated for SPRC Best Appearing Car and Most Professional Appearing Team. We put in a lot of effort and it's nice to have that recognised". Lucas Oil sponsorship continues into 2015 and the Super Pro ET team will have a new look this year. Brad's car owner and Super Pro ET racer Nick Good said that his three dragsters were in pieces in various places including gearboxes at Al O'Connor's but that everything was coming together. Nick said that he was particularly looking forward to the first outing of Top Dragster. "It's what my car was made for! ", he said. 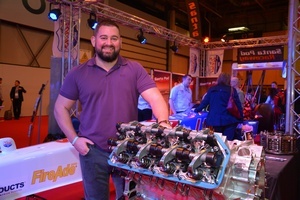 Nick was also pleased that nitromethane is to be allowed in Super Pro ET as his blown-alcohol dragster came with a suggested set-up for 20% nitro. "Now that we can do it I've got to try it once! ", he said. VW Pro racer Andrew Agroment (right, with Crew Chief Steven Agroment) is returning to the track after five years. "That was only one race and I didn't finish that - it broke off the line and I went home", he said. The formerly supercharged Black Baron Racing Beetle is now sporting a 450 hp turbocharged motor built by Dan Simpson at Vintage Speed. "It's going to be nice to get back", said Andrew, "I can't just sit and watch. As well as the motor we have saved a hundred kilogrammes and we have new slicks. It's going to behave a bit differently so I am going to have to learn to drive it... I'll have to practice burnouts somewhere, maybe outside the workshop! We plan to do all of the VWDRC rounds starting at Easter, and maybe run in Pro ET at the European Finals". When last seen Andrew and Steven were on the hunt for a new race suit. 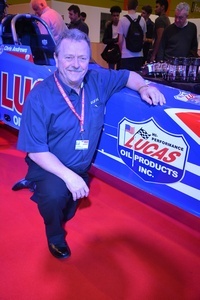 Les Downey of Eurodragster.com sponsor Lucas Oil Products was pleased to report that business was up by eighteen per cent last year. "We now have Nigel Morris of the Bigfoot team working with us to look after Europe which is our main target for sales", said Les. "We have a new range of XRF racing oils available at the end of January so keep an eye on the web site for details. We will still be supporting Santa Pod Raceway this season as well as Junior Dragster, Chris Andrews, Nick Good's teams including Brad Jackson, and Albert Carter's karting. 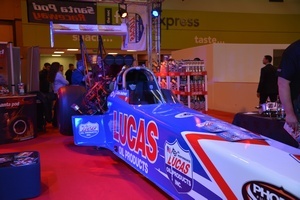 We have been talking to Santa Pod Raceway about a Lucas Oil Day similar to the Junior Dragster Day. We could have between twenty and thirty cars there." 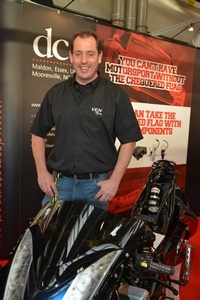 Steve Venables' 7.0-second Super Street Bike was on display on the stand of sponsor DC electronics. Steve said that a lot of the off-season effort has gone on daughter Jemma's Super Street Bike. "We've rebuilt Jemma's bike from the ground up", he said. "This year her bike will be the same spec as mine with a Gen2 Hayabusa engine so that we can share engines, new injectors and ne wOwen Developments turbo - Owen Developments are sponsoring Jemma and I this year and we are still working with DME Racing. DC Electronics have rewired Jemma's bike and will be providing tech support. As you know I sold my previous bike to Mark Hope - had my current bike not picked up towards the end of the season I would have held on to it as a safety net." 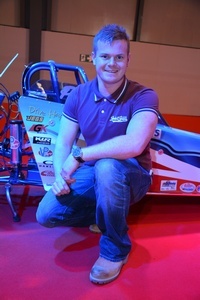 Super Pro ET racer Liam Jones had a surprise for us as he revealed that he would be contesting a full season in FIA Top Fuel Dragster driving one of the Rune Fjeld Motorsport stable of dragsters. Licencing is planned for a Run What You Brung before Easter. "I wanted to do it and I just decided f*** it! ", said Liam. "I've done Super Pro for two seasons and thought it was time to do other stuff". We will still be seeing Liam's camouflaged Super Pro ET dragster on track this season as, in a very welcome return, it is to be driven this season by former Pro Stock and Super Gas racer Conrad Stanley. "I can't wait", said Liam, "it's going to be a big season!" ACU UK Pro Stock Bike and UK National 9.50 Bike Champion Alex Hope plans to run selected FIM European Championship rounds in Pro Stock Bike and the full ACU UK Super Street Bike Championship. "The Stocker and the Super Street Bike need no work so we are concentrating on my brother Mark's bike which will be the same spec as Steve Venables' bike", said Alex. "The 9.50 Bike will be out with another rider. We are working on a trailer to fit all of the bikes, and we are also trying to persuade Dad (former PSB racer Chris Hope - Ed) to have a go on the Pro Stock Bike at an ACU round." 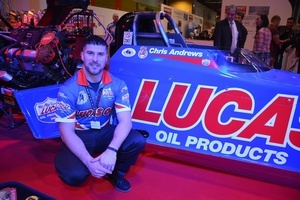 Top Fuel Dragster racer Chris Andrews has not yet decided out of whose stable to race in 2015. "A safe and reliable car is available from Rune Fjeld but the plan is to have our own team", he said. "Do we continue with the DSR chassis or get our own car? I don't have the knowledge to tune the car so do we get someone such as Mike Domagala in to tune or have an agreement with Rune? Hopefully we will be able to make a decision by the end of this month. There are lots of options - for example, we have a very good working relationship with the Lucas family and I know that I fit into Morgan's cars. A car from Lucas would have the best of everything but then you have to ask yourself whether the tracks could take it. Or we could buy the DSR chassis from Rune; it's the best chassis I have driven, you could feel a lot more and I was able to feed back to Rune how it responded to changes in tuning. Luckily the end-years of our two businesses African Oil Products and TRX Logistics are in January, and we again have the backing of Lucas Oil this year, so when we get back from Pomona in February then we should know the size of our play fund!" UK National Super Pro ET Champion Scott Hauser (right, with Geof Hauser of Eurodragster.com sponsor Hauser Race Cars) said that apart from freshening its motor not much work in planned on the Bang Tidy dragster. "The engine was out last week then we got an invitation to appear at this show! ", said Scott. "We put on a new scoop at the end of the season and immediately picked up one and a half miles per hour, and the motor runs cleaner with new K&N air and fuel filters". "We didn't lose a single part all year", added Geof Hauser. Hauser Race Cars' new four-link dragster kit has attracted a lot of interest especially in Europe although the recent exchange rate changes have not helped business. The team will be enjoying new sponsorship from Fel-Pro, Champion and Speed Pro this season. Jan Phersson of Eurodragster.com sponsor Simpson Europe said that European business is growing steadily as is product development. "We are working on lighter suits, lighter belts and lighter HANS devices", he said. "It's really good that we have HANS devices for Junior Dragster racers now - you can break your neck at seventy kilometres per hour and these kids are doing a hundred and fifty. We organise seminars around Europe about the use of our equipment; we see race cars with totally wrong seat belt geometry which is why some racers come through crashes better than others, so our seminars help to educate racers. We also do sled testing to learn more about controlling body movement". Jan said that Simpson had initially not been successful in Europe and withdrew from the market and that when Simpson Europe was set up ten years ago it took five years to re-enter the market. Now Simpson Europe covers the whole continent including Russia. "As well as drag racing we work with Rally, GT3, Bentley, Citroen, drifters and hillclimbing", said Jan, "but drag racing is easily the most dangerous. I am involved in consultation on rule books for a lot of sport around Europe to ensure that the rules aren't contradictory. In general I think that the level of understanding among racers has grown tremendously - they don't see safety equipment as a cost but as an opportunity. When you feel safe you perform better". Jan added that he plans to race with his Super Stock Dodge Viper this season. "We did some testing last year and we've had to change the rear end and transmission gearing and refresh the engine", he said. "The Viper V10 is a bad engine but it's fast!" 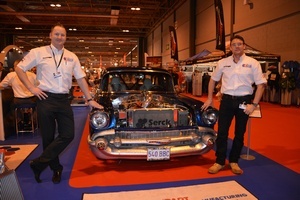 Graham Smith (left, with Adam Sayers) said that Serck Motorsport edged into drag racing slowly. "We had a trailer which we took to races", he said. "We met Ian Hook whom we sponsored with a radiator. We realised that Street Eliminator appealed to both racers and the street, the cars need a lot of cooling and a lot of understanding - the temperatures are enormous and the problem is airflow - and hot rodders have also always got an eye on the temperature gauge so you don't just want to make do with a radiator. Then I got Snow White and I used it as a rolling test bed for our products. We have supplied radiators for Mark Todd, Ron Haslett, Alam Williamson, Team Bonkers and Andy Fadster. The radiator in Adam's Chevy (The car on display - Ed) is ten years old and we've never seen a drop out of it. We have recently become distributors for Wizards of NOS and Sunoco, and we sell a lot of Setrar oil coolers - the range has taken off like a rocket, they are so reliable that they leave and they never come back. We are very pleased to sponsor a lane at Shakespeare Country Raceway as want to help drag racing, and we want to show other industries about cooling; we work with Formula 1, McLaren GT and Morgan as our products apply to all forms of motorsport - everything gets hot!" Shakespeare County Raceway Marketing Manager Jerry Cookson says that it is business as usual at the Warwickshire track. "Just a couple of things to sort out", he said. "We are looking forward to the Springspeed Nationals and maybe seeing some Europeans coming over, and we are working on one or two things for the NSRA Nostalgia Nationals. We are very pleased with the lane sponsorships from Serck Motorsport and On The Bottle, and the National event sponsorships from Hillingdon Speed and Spares. It's a grass-roots track and without grass-roots support we couldn't do it!" Deborah Laugher is looking forward to getting down the track in her supercharged former Super Modified Corvette. "If the object of testing is to find issues then we had a successful year last year! ", she said. "Now I need to remind myself what the end of the track looks like - that's why I ran in my street car last time out, just to see the shutdown area!"